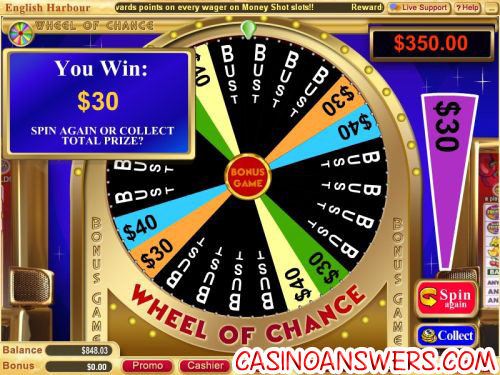 Wheel of Chance 5-Reel Video Slot Guide & Review - Casino Answers! 5-Reel Wheel of Chance is a 5-reel, 20-line video slot machine from Vegas Technology. It has a scatter symbol, a wild symbol, free spins and a bonus game. You can play Wheel of Chance at English Harbour Casino and Go Casino. Wheel of Chance has an autoplay feature. You can choose your number of spins and number of seconds between spins. Then you can choose your stop conditions, such as not stopping until all of your spins have completed, stop when jackpot is won, stop if a win exceeds or equals your specified amount, stop on ay win and stop if credits increased/decreased by your specified amount. Once you have started autoplay, you can stop at any time. The top jackpot in the 5-Reel Wheel of Chance video slot is 8000X, if you hit 5 wild diamond symbols. 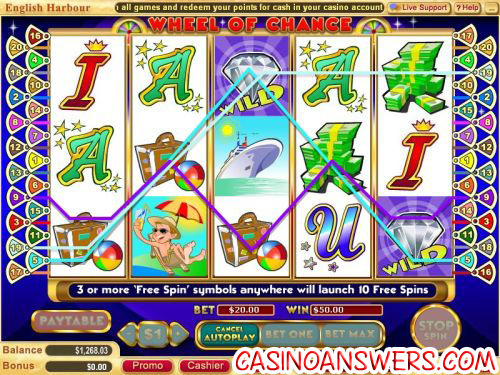 The diamond symbol substitutes for all symbols except for the bonus wheel and the free spins scatter symbol. Your prize is doubled when one or more diamonds are part of a winning combination. If the bonus wheel appears on reels 2 and 4, you will trigger the bonus round. Wheel of Chance’s bonus round is a wheel with different prizes on it. Spin the reel and have it land on a prize. You can then decide whether to collect the prize or spin again. Prize symbols will be replaced with Bust symbols. If you spin again, you can add on to your previous prize, but your chances of going bust will grow after each spin. You will have a 10X multiplier for the Wheel of Chance bonus game. Hit 3 more scatter symbols and you will be awarded 10 free spins. All of your winnings will be tripled. Additional free spins can be won from free spins, however they are not tripled. With free spins, multipliers, a bonus game and more, Wheel of Chance gives you many chances to win big. If you want to try to spin the Wheel of Chance, you can get $800 in your first four deposits at English Harbour Casino. Can US-based players play Wheel of Chance? Yes, all Vegas Technology casinos (including English Harbour Casino) accept US players. What’s the difference between the 3 and 5-Reel Wheel of Chance games? There are many differences. The 3-Reel version is a classic slot machine, while the 5-Reel we’re reviewing here is a video slot. They both have the same idea behind them. Both games do include Wheel of Fortune bonus games. Does Wheel of Chance have a progressive jackpot? No, but English Harbour has other progressive jackpot slots such as Pay Dirt and Treasure Trail for you to play. Is there a wheel of fortune slot machine? Is there a wheel of fortune casino game?